Avocado Pesto Pasta is full of nutritious Spring vegetables and makes a healthy vegan pasta recipe that can be ready in under 30 minutes! In a large sauce pan or skillet sauté broccoli with 2 tablespoons olive oil over medium heat for 1-2 minutes. Add water, cover, and let steam for 6-7 minutes or until broccoli turns a bright green. Remove broccoli from skillet and set aside on a plate. Add remaining 1 tablespoon of olive oil and onions. Sauté for 4-5 minutes over medium heat. Add all pesto sauce ingredients into a high-speed blender, such as a Vitamix, or a food processor. Blend for 1-2 minutes or until sauce is completely smooth. Add pasta, sauce, broccoli, peas, corn, and remaining ¼ teaspoon salt to the saucepan with the onions. Toss to combine and warm up over medium-low heat for 2-3 minutes. Serve avocado pesto pasta with ¼ cup toasted pine nuts and Parmesan cheese and enjoy! You can also use gluten-free linguine, fettuccine, or spaghetti pasta. 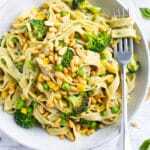 To make this recipe vegan, leave off the Parmesan cheese or use a vegan Parmesan cheese and make sure the pasta is egg-free.